I first applied to Google Adsense back in 2005 or 2006. Since that time, I have applied and gotten approved many times for related business entities or helping others set up their own Google Adsense accounts. Each time, my applications have been approved to start using the Google Adsense program, so I feel like I can offer some solid advice on how to make sure you get your own approved account. Now, if you have been following my blog, you know that I had a bit of a set back with Google Adsense, but I am now actively using Google Adsense as though nothing happened. The reality is that Google Adsense is the best contextual marketing program on the market with the most advertisers and the highest payouts. I love the Adsense program and definitely recommend those involved with niche websites to at least get started with Adsense. To be honest, its shocking to hear how many people get declined from Google Adsense when they apply. I’ve received many emails from readers saying that their applications were declined. I’ve read complaints on forums or comments about the difficulty of getting approved with Google. I personally have never experienced this. But I’ve also been very careful when I apply. 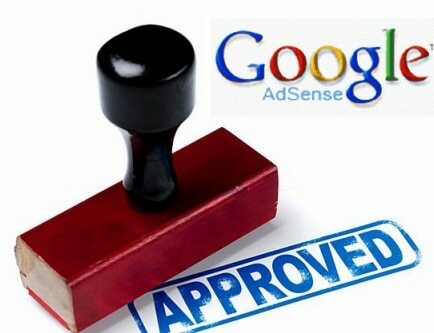 Below you will find the process I have used to apply and get approved to Google Adsense. In a nutshell, there are 5 steps to applying and getting approved to the Adsense affiliate program. Google wants to know that you have an valuable resource! So, in order to increase your chances of approval, you need to create original, articulate, and useful content! This should go without saying for any website; however, I can guarantee you that people have applied to Google Adsense with autoblogs, or copied articles from EzineArticles.com. Then they wonder why they didn’t get approved. In addition, you are more likely to get approved if you have a great looking theme or site. I recommend using a premium theme (if using WordPress) if possible. You can still use a free theme, but do your best to find one that looks high quality. Finally, to give your site an extra boost on the “look” score, I recommend having a logo designed. You can do it yourself, or you can hire someone on Fiverr.com if you are cheap (like me). For $5 you can take a generic theme and make it look much nicer with a custom logo. Overall, make sure that your site is fully developed with content, logo, layout changes BEFORE you submit the site to Google. Quick Tip! 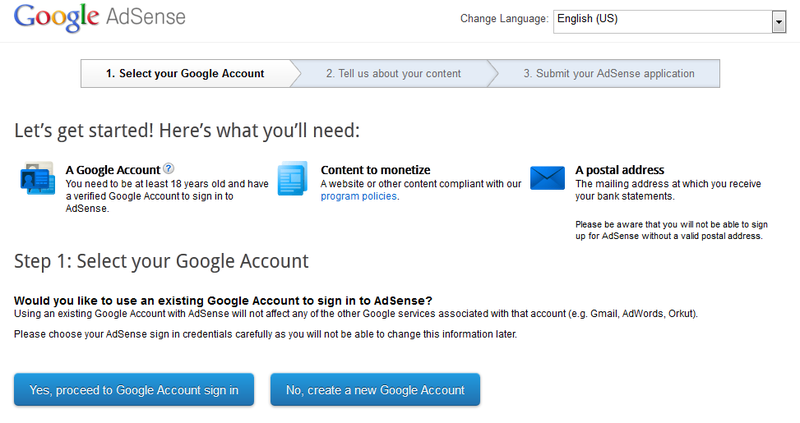 Remember, you CANNOT apply to Google Adsense using a site that has ever been used for Google Adsense before. 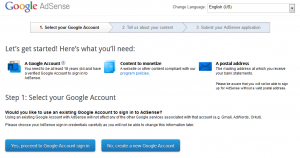 You can apply online to Google Adsense right here. Here you will supply your website URL, Individual name or Business Entity, contact name (you if applying for yourself; could be someone different if you are applying as a business entity), mailing address, phone number, email address, and perhaps one other basic bit of information. You are not required to submit your TIN or bank account information at this stage yet. This will happen after you get approved. Make sure to give accurate phone and physical address information. You will be REQUIRED to verify your phone number and they will mail you a PIN to the address you supplied. However, this does not occur until step 4. The online application itself only take a few minutes to fill out. Approval usually occurs within 24 to 48 hours now. If you follow my steps above for creating a unique site that has never been involved with Google Adsense before, you should have no issues getting approved quickly. At that point, you will receive an approval email from Google that explains the process. Essentially you are “temporarily” approved until you meet other verification steps. This means you can start placing ads on your site and you will see the clicks and revenue coming into your account. Google is simply monitoring your activity to make sure you are not clicking your own ads or sending suspicious traffic. As long as you leave your ads alone and don’t do anything suspicious – you should be fine. In addition, you can also add the Google Adsense code to ANY of your other websites! You don’t have to apply for each new site. Once you have any approved account, you can use the same Adsense code on all your sites. However, before you get paid, you need to verify a few things. First, Google will send you a PIN verification in the mail. This will come after a week to 10 days usually. There is no rush, but at some point you will need to verify your bank account and submit your tax information. The bank account must be in the same name that you applied with. (So, if you applied with your business entity, the bank account must be for the business entity). To get paid by ACH (the best way), you need to supply your bank account number and routing number. Then Google will do a test deposit of a few cents. 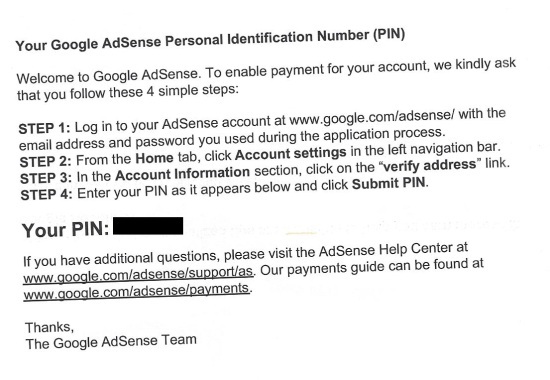 You will then input this amount in your Google Adsense account to finish the verification. Then you can start getting paid monthly! You will also need to supply your TIN number and complete the necessary tax documents (this is all handled online by Google and only takes a couple of minutes). If you haven’t previously verified your phone number, you will need to do so. Google will place a test call with an automated code to you. Input the code, and you are good to go! These are the exact steps that I have used many times to get myself, my business entities, or the accounts of others approved to Google Adsense. On the surface, they are fairly straightforward; but trust me, lots of people never get approved. This could be for a number of reasons ranging from low quality content, to suspicious activity. But if you follow the 5 steps that I’ve outlined here, you should get approved without any issues. Have anything to add to the discussion? I’d love to hear your thoughts below.